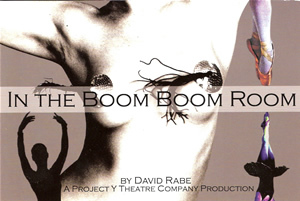 By Tony Award winner David Rabe. Set in the streets, apartments, and go-go clubs of 1968 Philadelphia, In the Boom Boom Room focuses on Chrissy, a young dancer working as a go-go girl until she can break into the world of “real” dancing. A dreamer, Chrissy begins her journey as a girl trying to become an adult, but struggles making the most trivial decisions. In a whirl of 1960s music, dance, and dreams, the play takes us through the life of a hopelessly romantic young woman determined to make it big. Cast: Sarah Nelson, Dan Via, Grady Weatherford, Diane Cooper, Kate Debelack, Sam Elmore, Yasmin Tuazon, Deepa Gupta, Jay Dunne, Caitlin McAndrews, and Scott McCormick.